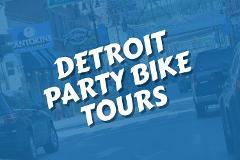 Book a party cycle tour today for your choice of 4 routes throughout Detroit - Downtown, Midtown, Corktown, or Eastern Market. Want to ride the Michigan Pedaler but don’t care to get a big group together? We offer special dates for individuals or small groups interested in buying individual tickets for The Michigan Pedaler.